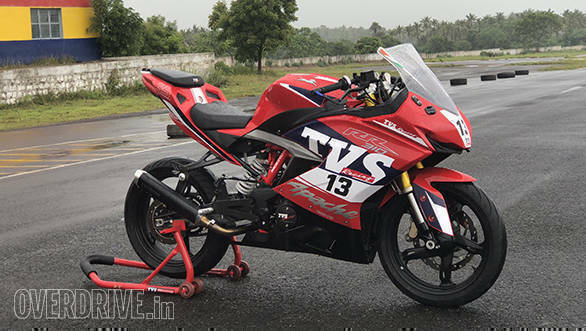 The BMW-TVS project's first offspring was TVS' Apache RR 310. The bookings for the BMW Motorrad G 310 R and BMW G 310 GS have only recently opened, in fact. But as we have noted earlier, the TVS-BMW arrangement was strictly for development and production of the platform derivatives. And here's an example. 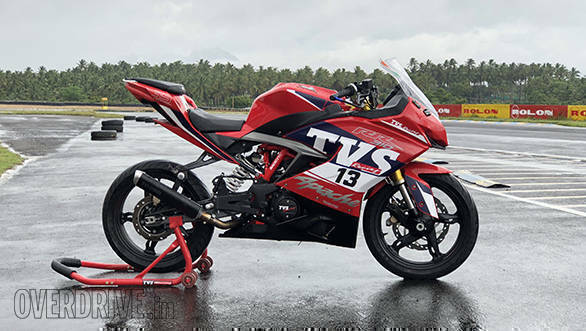 Even before the BMW bikes show up in the market, TVS has already conducted the first of five rounds of its one-make championship where 12 of these, the Race-spec TVS Apache RR 310 will race. And today, despite the weather, I've one of them, #13 to be precise, and the Kari Motor Speedway. Let's put them together and see what happens eh? The engine on the Race-space RR 310 is not different from stock in major hardware terms. But when you're roaring down the Kari Motor Speedway straight, all of these thoughts dissipate like a drop of ink in the ocean. Because the Race-spec RR 310 isn't slow. It comes out of the last corner with intent and the super-short-travel race throttle is nearly always pinned to the stop. The flat, loud blat from the exhaust reverberates off everything as the speed gathers rapidly. Did I mention that it was raining the whole time? The RR 310, though, is a stable machine. So braking from 150kmph plus into the first corner felt un-dramatic. Tipping in to Turn One showed that the Pilot Street had enough grip and that would be the one thing that I wouldn't have to worry about too much for the rest of the lap. You can also see, more or less, why TVS Racing chose not to 'update' the chassis to race-spec. In racing, you keep things simple, and don't fix what isn't broken, as it were. Coming out of Turn Three is the first time you feel the drive performance of the engine. And it's both good and slightly odd. The super quick throttle means that you're at full gas very fast, but this feels completely natural because the torque curve feels high and flat. As in it has no steps in it. So you come on the gas hard, the roar rises a bit in pitch, the red light comes on (past the stock 10,500rpm redline) and you feed the RR 310 another gear. Progress is rapid and undramatic. 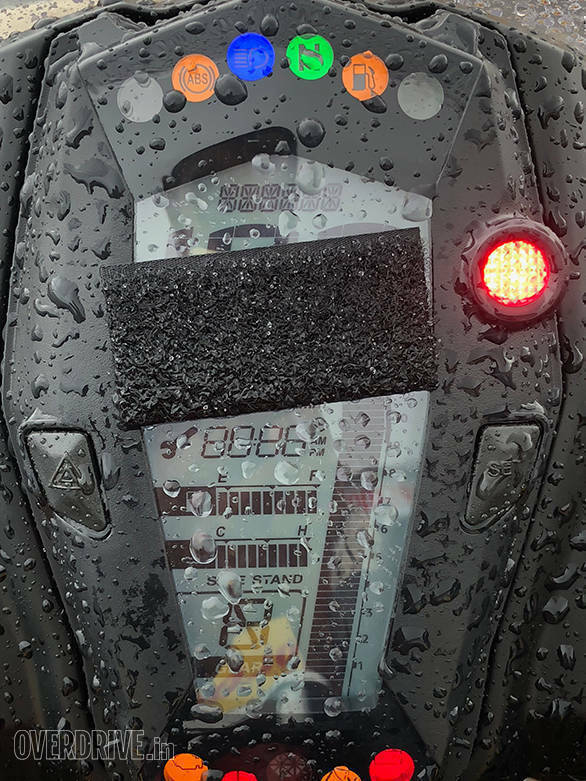 The speedo readout on the race-spec TVS Apache RR 310 is covered - it serves no use to a racer and is an added distraction. 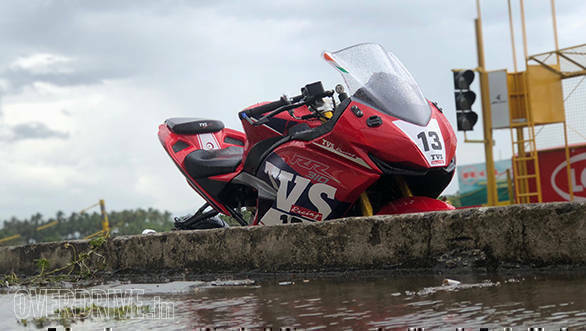 The RR 310 continues to show its balance between ride and handling by keeping things smooth in the run to the first of the two chicanes at Kari. The section has a few undulations through the kink that are absorbed and dealt with easily. The stability of the frame and the grip of the tyres means that the water standing at the apex of the chicane's exit doesn't bother me. The side-to-side transition feels natural and you can get on the throttle very early, always good on a smaller displacement bike with limited power reserves (in comparison to say, a 600 where any loss in momentum is easily overcome by a more profound reserve of power). Where the RR 310 really impresses in the long right hander and the long left hander that's the two-corner set that ends the lap at Kari. I keep moving the braking points from conservating to Murphy-tempting without causing my brain to shrivel up into a walnut. That's a huge hat tip to the grip of the Michelin as well as the feel and feedback of the brakes in these conditions. Similarly, the frame's characteristic stability means I can keep deepening the lean angle with confidence despite having to cross two 'strips' of running water through this complex. Much fear but no drama. Very neatly done, TVS! What I missed from the race bike, really is a word that's already appeared in the article three times. And that's a sense of theatre and occasion. 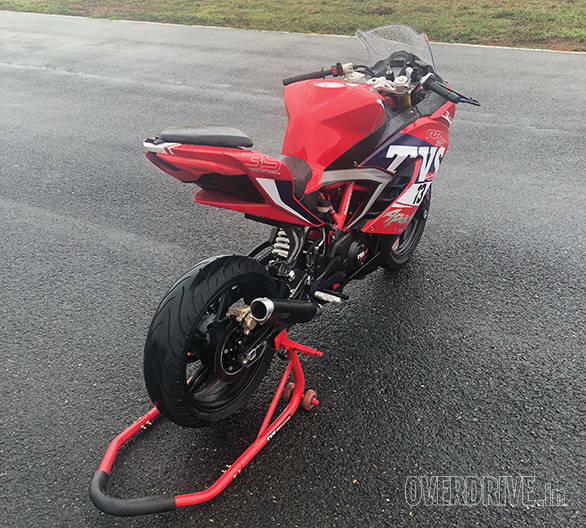 But race bike's aren't designed to be spectacular. They're designed to be efficient so that we can do spectacular things with them. TVS also added covers on the lenses at the front and rear in matched red and added blank-out plates at the mirror mounts. 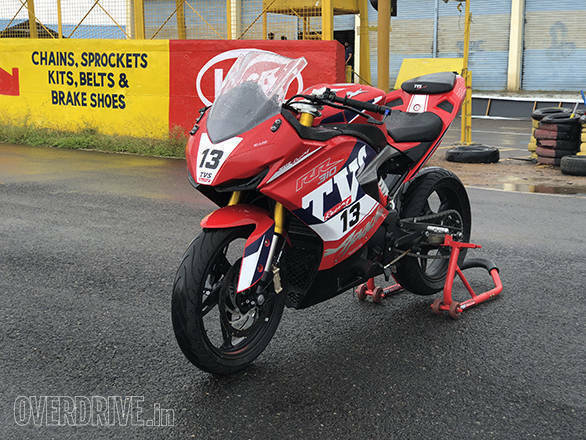 And by that standard, TVS has the race-spec Apache RR 310 nailed!